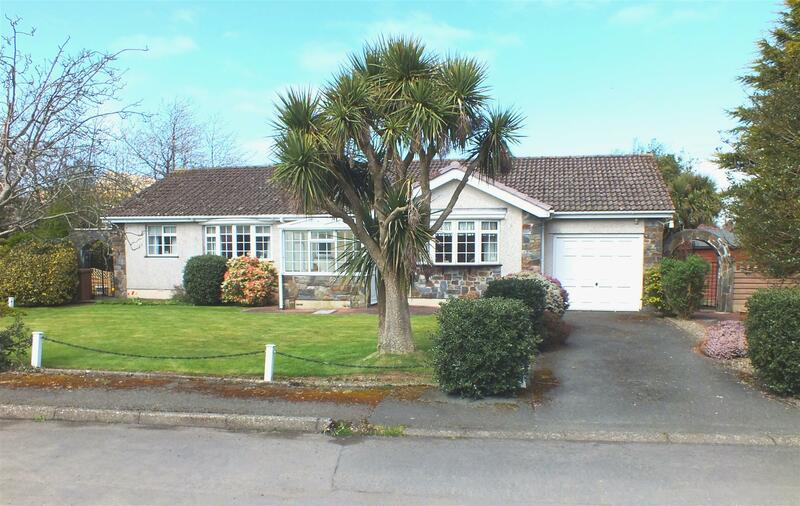 An Attractive 2-3 Bed True Bungalow set on a Generous Plot in a Pleasant Cul De Sac. Walking Distance to Local Primary School, Play Park, Spar/ Post Office & Main Bus Route. 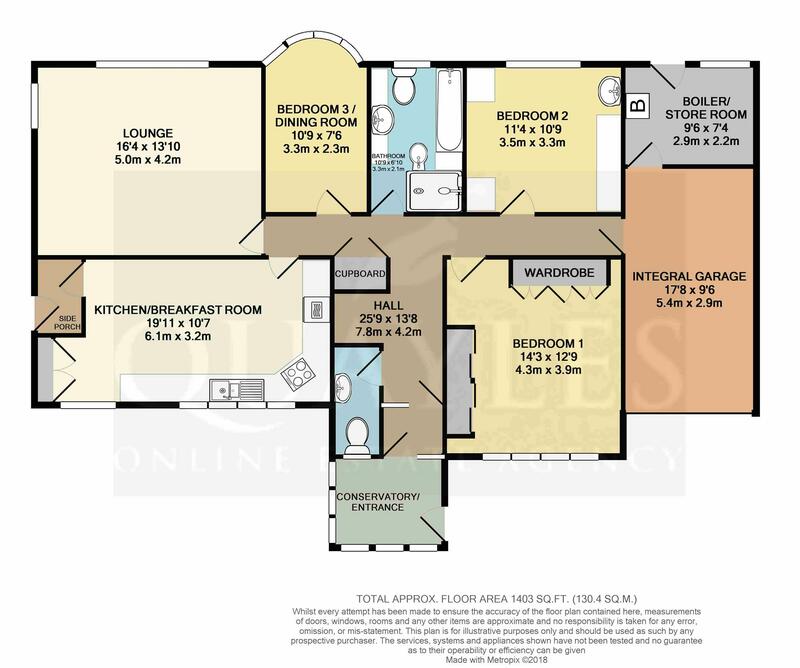 Bright & Spacious Accommodation with Excellent Built In Storage Solutions. Comprising Conservatory/ Entrance, Inner Porch & Reception Hall. Spacious Lounge & Dining Kitchen with a 2nd Porch to the Side. Dining Room/ Bedroom 3, Bathroom & 2 Double Bedrooms with Built In Furniture. Oil Fired Central Heating & uPVC Double Glazing Throughout. Integral Garage & Dual Access Boiler Room/ Store. Open Plan Garden to the Front, Driveway for 2 Cars with Paved Hardstanding. Enclosed Rear Garden with Lawns, Patios, Summer House and Shed. From Ballacraine crossroads travel along the TT course into the village of Ballaugh. Turn left immediately after the car centre and bridge, onto Station Road. Continue past the Spar/ Post Office and take the next turning on the left into Rowan Avenue where number 2 will be found as the second property on the right. A wonderful addition to the property which enjoys the morning to afternoon sunshine. Constructed of uPVC double glazed panels on a low wall base. Door to the original entrance porch. Part glazed uPVC entrance door. Light and tiled floor. Glazed inner door to the hall. Coved ceiling. Loft access. Power points and telephone point. Shelved airing cupboard housing the insulated hot water cylinder. Doors to the integrated garage. Fully tiled to the walls. Fitted with a white WC and pedestal basin with a mirror above. Obscure glazed uPVC window. A naturally bright and spacious dual aspect room with two uPVC windows, one with a decorative leaded panel, the larger looking out over the rear garden. Coved ceiling. Smoke detector. TV and telephone points. Quality wood effect floor covering. A large room with ample space for a dining table and chairs. Fitted with an excellent range of country style wood fronted wall, display, base and drawer units, together with granite work surfaces incorporating a 1 1/4 bowl 'Asterite' sink with a mixer tap. Inset ceramic hob and filter hood. Built-in 'Bosch' double electric fan ovens with grill. Plumbing for a washing machine. Space for a fridge freezer. Background tiling and counter lighting. Recessed built-in larder units. Deep set uPVC bay window plus an additional front window. Inset directional ceiling lights. Easy care vinyl floor covering. A glazed, multi pane door leads to the side porch. Fitted coat hooks. Tiled to mid height. Easy care vinyl floor covering. Half glazed uPVC door to the side patio. A full height uPVC bow window looks out over the rear garden. Suitable for use as a formal dining room or single bedroom. A large, fully tiled room fitted with a rose pink suite of panelled bath, WC, bidet, and large vanity/ storage unit with an inset basin and illuminated mirror. Deep set, tiled enclosure with a fully plumbed shower, handrail and seat. Close boarded ceiling. Mirror fronted vanity unit. Obscure glazed uPVC window. A double room fitted with an array of furniture including wardrobes, bedside drawers and shelves, overhead lockers and a dressing table/wardrobe unit. Additional modern high gloss vanity unit with a top mounted sink, illuminated mirror and storage. Rear facing uPVC window and an obscure glazed panel providing natural light to the inner hall. A truly spacious room with ample space for a 'Superking' size bed if required. Having two separate walls of built-in wardrobes, one with hanging rails and top lockers, the other with sliding mirrored door and a combination of shelving and hanging rails and top lockers. Built-in TV niche. Having a deep set uPVC bow window to the front elevation. A generous space which has limited floor space at present due to a platform with steps down to the main area and a door to the rear boiler room/store. Ladder access to a storage area with a pitched roof. Electrically operated up and over door. Light and power. Electric meter and consumer unit. Housing the 'Worcester' oil fired boiler. Part glazed wooden door to the rear garden. Natural light and ventilation via a uPVC window. Power points. A generous and well maintained lawn with shrubs and gravelled borders. Post and chain fencing. Paved area to one side with fencing to the boundary and gated access tot he rear garden. A tarmac drive provides parking for two cars and leads directly to the garage. A paved pathway leads to the front porch. Mostly laid to lawn but with concrete panels and fencing to the rear boundary. Neat hedging to the side. Concrete pathways and paved patio areas. Summer house. Flowering shrubs and blossom trees.